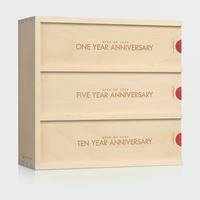 This Anniversary Wine Box pays homageÂ to vintageÂ wine barrel stamps.Â PersonalizeÂ it with theirÂ names, established year and location they were wed or reside. 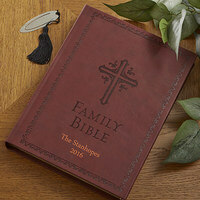 Makes a wonderful gift to be cherished for the ages! 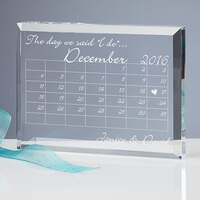 Personalized Glass Wedding Clock - Everlasting..
A special moment in time is captured forever with our Beloved Memories Engraved Wedding Clock.We personalize the sculpted, arched clock by skillfully engraving your choice of 2 design options to commemorate their special occasion. 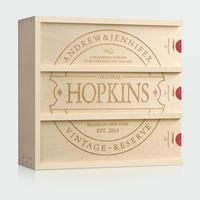 For newlyweds, this is a truly timeless gift they'll never forget! 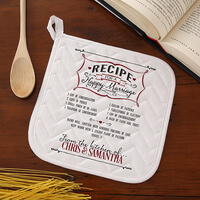 Personalized Wedding Potholder - Recipe For A..
Give the bride and groom the secret ingredient for a happy marriage with Our Recipe for a Happy Marriage Apron & Potholder! 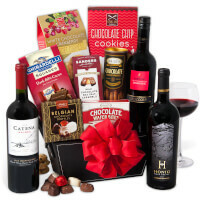 Mix one cup of consideration with a small pinch of in-laws and sweeten with lots of love! Not found in any cookbook, our special recipe is sure to cook up rave reviews among married couples! 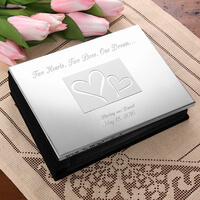 Engraved Silver Wedding Photo Album - Love Ever..
Our Love Ever After Personalized Photo Album is ideal for the happy couple to showcase photos from engagement parties, bridal showers, rehearsal dinners, and all the romantic and memorable moments of their engagement and wedding. Beautifully crafted of shimmering silver-plate featuring two hearts artistically reversed engraved against a matte silver canvas, symbolizing their two hearts sharing one dream ahead. 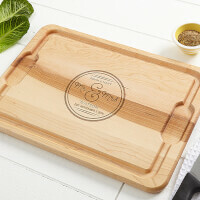 Our Circle Of Love Personalized Maple Cutting Board is the perfect addition to any marital kitchen. Available in 2 sizes, these environmentally-sustainable Maple cutting boards are created from reclaimed North American hardwood that has been carefully selected for quality and purchased from mills throughout the country. Because wood is a natural product, color and grain will vary on each cutting board. 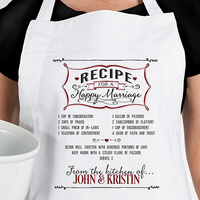 Personalized Wedding Apron - Recipe For A Happy..
Personalized Wedding Canvas Print 12x12 Forever..
For those who love to entertain in a BIG way, our Party Hardy Personalized Party Tub is the perfect "self serve" container for outdoor barbecues or indoor buffets! 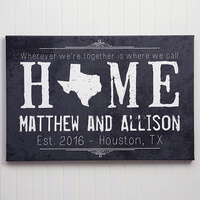 Makes a unique, personalized housewarming gift! 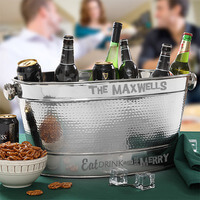 Fill with drinks, chips, or other party items and it becomes an extraordinary gift basket! 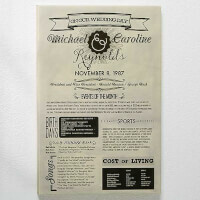 The day you were married is one like no other so commemorate it with our Personalized Anniversary Chronicle Canvas Print. 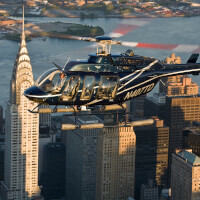 Many exciting events were happening around the world the year you were married. 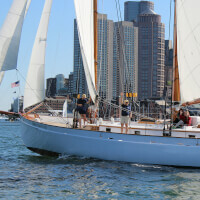 We carefully researched the specific details and events of this special time period to give you an accurate record...enjoy going down memory lane! Note: The year used to compare is the last COMPLETED year. 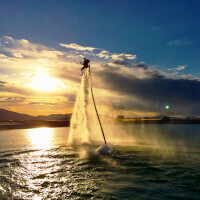 We are unable to process orders before March 1st for each new year, due to lack of data. 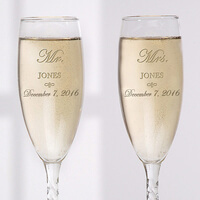 Personalized Crystal Wedding Champagne Flutes -..
Give them the perfect wedding keepsake with our The Day We Said I Do Personalized Keepsake! 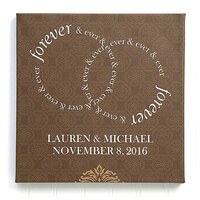 We'll skillfully personalize this unique piece with the wedding date and the couple's names, creating a lasting and loving gift they'll treasure today and always.Once you enter the wedding date (including any year), the month will appear at the top and the heart will appear on the day you were married! 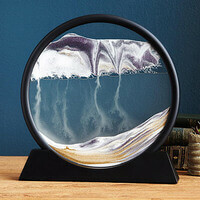 A perfect wedding, anniversary or engagement gift! 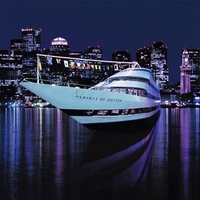 Weddings are wonderful occasions, a time to celebrate love, life, and a future together. 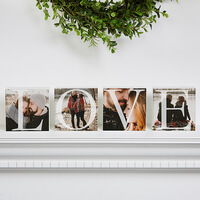 Finding the best wedding gift for your friend or loved one's special day can be fun and exciting, and uGiftIdeas.com has plenty of wedding gift ideas that your bride and groom will love. 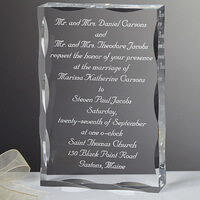 Most popular are personalized gifts for couples - capture an image of the loving couple, or capture their wedding invitation in a personalized crystal for a unique and stylish gift that they will cherish for years to come. 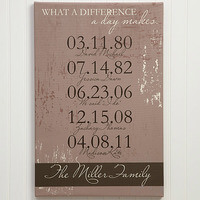 The look on personalized wedding gifts is exquisite, and your bride and groom will be thrilled. 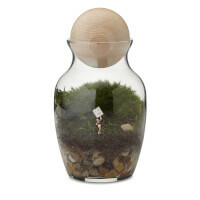 Look no further for wedding gift for brides, as well as wedding gifts for grooms. 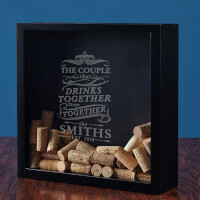 From the edgy bride and groom to the conventional, you will find the perfect wedding gift on uGiftIdeas.com. And lets not forget the bridesmaids and groomsmen. Tradition calls for the bride to choose special gifts for bridesmaids, and for the groom to select thoughtful gifts for groomsmen. You have enough to worry about if you are getting married. 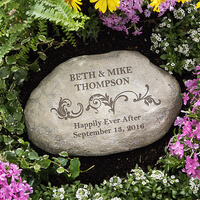 Let us help you find the best gifts for groomsmen and bridesmaid in a jiffy from a variety of high quality, personalized gifts.